Providing the Toronto North area with professional, fast and eco-friendly junk removal services. 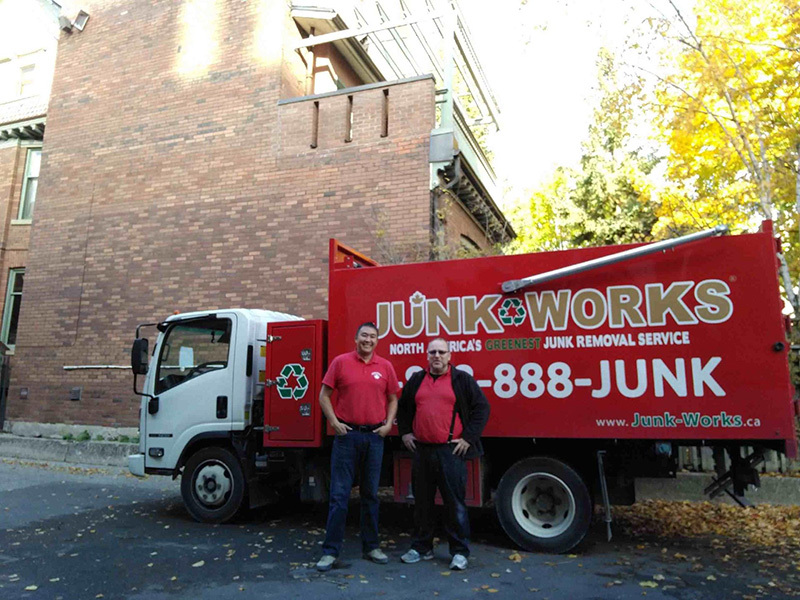 Natalia and David Alaev are Junk Works franchise owners of Junk Works Toronto North. Their territory covers the greater Toronto area which includes downtown Toronto, North York, Richmond Hill, Concord, Maple, Woodbridge, and Markham. When Natalia and David were looking for new opportunities to run their own business, they happened upon an ad about Junk Works. Junk Works presented unlimited potential to grow the junk removal business. The team of Natalia and David thought they could be different and make junk collection in Toronto better than their competitors. They took the plunge and bought the franchise in November 2014. Their joint strengths make them a successful team. Natalia’s degrees are in economics and accounting. She handles the financial aspect of the business. Before David became a Junk Works owner, he was employed in construction and property management. That experience has provided him with the knowledge to determine the best approach to the more difficult jobs. Natalia and David stated that their goal is to provide excellent customer service. People who need their service are downsizing, renovating, moving to a new location, have lost a family member, or just want to start a new life. Natalia and David state, “We are happy to help people get rid of junk and move on with life.” Junk Works Toronto hauls and remove all types of items like old kitchen appliances, furniture, yard waste, broken televisions, garage clean outs and more. It’s been 2 years and 7 months since Natalia and David Alaev became operational and there seems to be no end in sight! Hire Toronto Junk Removal Services by calling 1-888-888-5865(JUNK) or book online. Are you looking for a trusted junk pickup service in the Toronto North area? Junk Works' staff does the junk hauling for you. We operate locally in the Toronto North area, and we can be at your home or business within minutes! We're also green: we recycle up to 60% of everything we collect to keep landfills down and communities clean. April 20, 2019 by F.P. Very polite, took their shoes off and worked very quickly. A pleasure to deal with and price was better than others i checked. January 29, 2019 by J.F. Staff were friendly and efficient.